We are currently in gear to bless some folks in the CSRA with FREE rent or Mortgage for a month! It’s our HOME FREE promotion! Courtesy of a business underwriter and sponsor of campaign…Peachtree Pools and Spas. Create a buzz; to listen. To bless listeners – who can’t use a little extra cash in a month! We seek to encourage them to think about what they would do with the extra money they would have if they didn’t have that obligation for a month. Vacation, extra payment, or even give away! Prize: One month of FREE rent or mortgage paid! It is a 8 week promotion with 6 blessings of FREE rent or Mortgage. Once qualified they are encouraged to be listening on Thursday mornings for their name to call in to WIN the free rent or mortgage. 1. Fill out the entry form. 2. Listen for your chance to qualify weekdays between May 15th and June 21st. If we call out your name, you’ll have 8 minutes and 30 seconds to call (844) 599-8830 and win a $50 home improvement gift card, plus be entered into the weekly drawing for one month’s mortgage or rent. Friday: 7:20 am, 12:20 pm and 5:20 pm. 3. 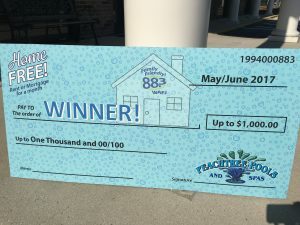 Once you’re qualified for the weekly drawing, listen Thursday mornings at 7:20 for John & Cleve to call you on-air (if selected) and give you one month’s free mortgage or rent (up to $1,000), courtesy of Peachtree Pools and Spas. When winner picks up their ‘check’ we have the photo check ready! First winner to be called out is May 18th!